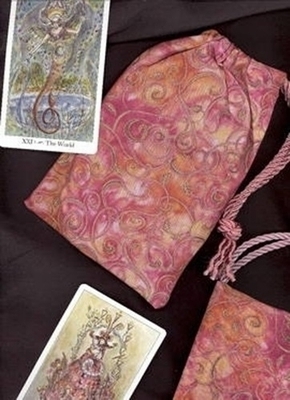 Regular Tarot Bags - Rosy Gold Spirals Regular Tarot Bag - Tarot Bags, Tarot Cards, Cloths, & More! This fabric was selected to complement the colors in the Paulina Tarot and the Fenestra Tarot. We think that this bag is ideal for housing either of those decks. However, it will also coordinate beautifully with many other decks. Hold your cards to the screen to see what cards you like with this beautifully-made tarot bag. Size: Measures approximately 4-3/4" wide by 7-3/4" to 8" inches tall (about 12 x 20 cm). Fits most standard tarot card decks (3" x 5" and smaller).